The static battlefield on the Western Front led to the development of new and more effective weapons, and the improvement of old ones. The enormous firepower of machine-guns, quick-firing artillery, and modern rifles forced the infantry to dig into the ground. The first shallow, temporary ditches gradually expanded into deeper trench systems. Most attacks against these trenches ended in failure. 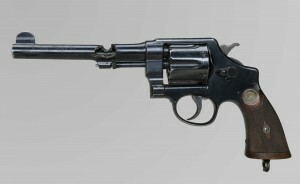 New weapons were introduced throughout the war to help break the deadlock. At the start of the war, most soldiers carried only a rifle and a bayonet, and most soldiers within the same small unit were similarly armed. As the war progressed, armies used a wider variety of weapons to better equip their troops for trench fighting and attacks across No Man’s Land, including grenades, rifle grenades, mortars, and several types of machine-guns. 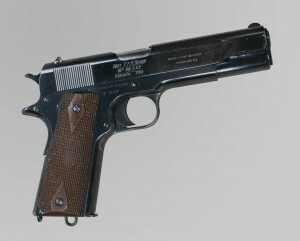 Small units, of eight to 30 soldiers, came to rely on a balance of rifles, machine-guns, and other weapons. Training for raids and attacks emphasized how firepower, movement, and innovation could be used to go through, or around, enemy strong points. 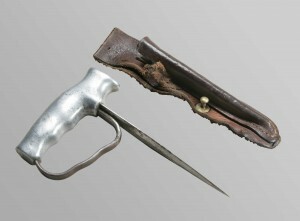 Unofficial weapons, including knives, hand-made clubs, and small catapults were particularly useful in raids. From late 1915, the Canadians engaged in a series of hit-and-run assaults on enemy trenches. These raids were meant to kill the enemy, to gather intelligence, and to win control of No Man’s Land. The Canadians soon acquired a reputation as fierce raiders, despite the heavy casualties they often incurred. In addition to the development of better and more varied weapons and tools for the infantry and engineers, the war also saw the use of poison gas, underground mining, airplanes, airships, submarines, and tanks. Many of the war’s most fearsome inventions, including poison gas and tanks, were intended specifically to aid armies on the attack and by 1917-1918, were being used effectively to break into and out of enemy trench lines. 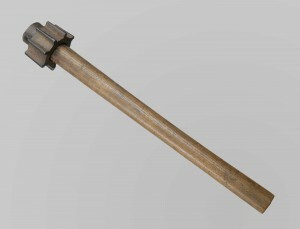 Soldiers often made their own trench clubs for use on trench raids or in hand-to-hand combat. The goal of the raid was usually to capture enemy prisoners, who would later be interrogated for information. Many small-scale raids depended on speed and stealth, with the raiders using silent, lethal weapons for their work. Other preferred raiding weapons were grenades, pistols, and knives. This club was fashioned from the handle of an entrenching tool, modified with an eight-pointed cast-iron ring.